NASA's Aqua satellite provided an infrared look at Helene as it continued tracking toward the Azores Islands in the Eastern Atlantic Ocean. Satellite imagery shows that Helene is decoupled from wind shear. The National Hurricane Center or NHC said "Helene's surface circulation has become fully exposed this morning with the center decoupled about 110 miles south of edge of the remaining deep convection." That means that the circulation or center of the storm is off-center, and the bulk of the storm has been pushed away from the rotating center. That decoupling happened because Helene is dealing with southwesterly (coming from the southwest) vertical wind shear. NHC noted that the wind shear is expected to increase later on Sept. 13. 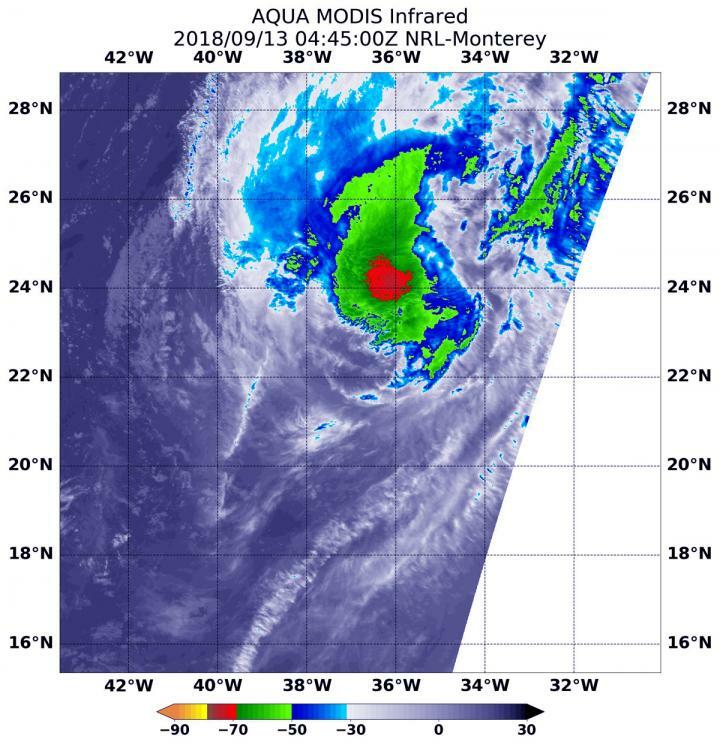 NASA's Aqua satellite passed over Hurricane Helene on Sept. 13 at 12:45 a.m. EDT (0445 UTC) and the Moderate Resolution Imaging Spectroradiometer or MODIS instrument aboard analyzed cloud top temperatures in infrared light. Coldest cloud top temperatures were being pushed northeast of center and were as cold as or colder than minus 70 degrees Fahrenheit (minus 56.6 Celsius). Cloud top temperatures that cold indicate strong storms that have the capability to create heavy rain. At 5 a.m. EDT (0900 UTC), the center of Hurricane Helene was located near latitude 23.5 degrees north and longitude 37.3 degrees west. Helene is currently about 1,170 miles (1,885 km) miles southwest of the Azores. Helene is moving toward the north near 14 mph (22 kph). A turn toward the north-northeast with an increase in forward speed is expected tonight followed by a turn toward the northeast over the weekend of Sept 15 and 16. Maximum sustained winds have decreased to near 75 mph (120 kph) with higher gusts. Continued weakening is forecast over the next couple of days, and Helene is expected to become a tropical storm by tonight. On Sept. 13, Helene is weakening while moving northward over the eastern Atlantic and interests in the Azores should monitor the progress of the storm.